okay - so here's the shawl, all blocked and ready to go with temporary buttons. I can't quite figure out what I want to do with that part. maybe some big wooden buttons? 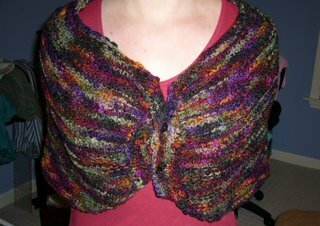 but I adore the shawl, even if it comes across a bit lopsided in the pic, it isn't in real life as long as I get it adjusted right. and as I sit here in my jammies on a friday night I have it wrapped around me and I do hope it sees more elegant occasions in it's future, but if nothing else - it keeps me warm! Instead of buttons, how about cool wodden toggles? I meant WOODEN, not wodden.